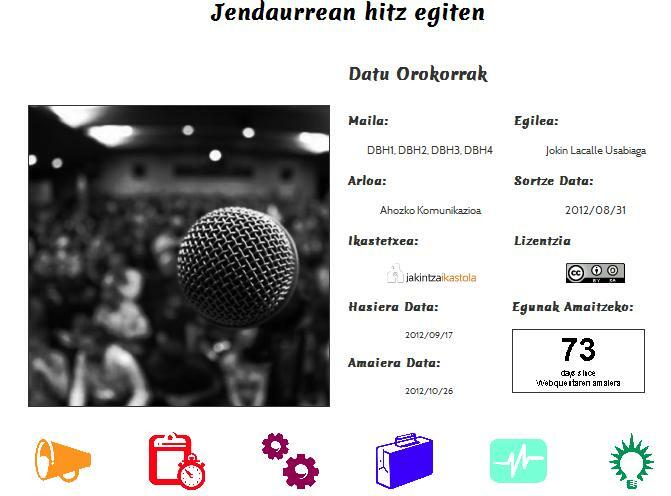 Ordiziako Jakintza ikastolako Jokin Lacallek Mintzamena DBHko lau mailetan lantzeko “Jendaurrean hitz egiten” webquesta egin du. 2. jarduera: Nola antolatu aurkezpenaren mamia? 5. jarduera: Jendaurrean hitz egiteko eguna heldu da! Dena prest dago lanean hasteko, animatu zaitezte! This entry was posted on urtarrila 7, 2013 at 11:47 am	and is filed under Baliabideak, Uncategorized. You can follow any responses to this entry through the RSS 2.0 feed. You can leave a response, edo trackback from your own site.